Product prices and availability are accurate as of 2019-03-31 12:40:28 EDT and are subject to change. Any price and availability information displayed on http://www.amazon.com/ at the time of purchase will apply to the purchase of this product. Italian heirloom brought to America in the 1880’s by the Nardello family from the Basilicata region. 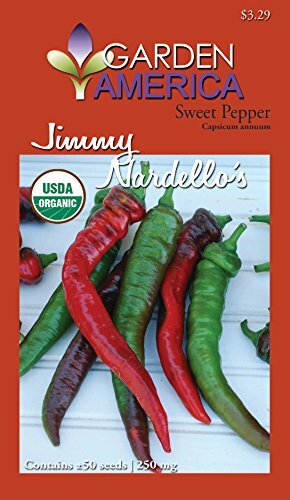 Super sweet and flavorful pepper, can be used green or red. Flesh is medium thick, excellent for slicing into salads or sautéing with onions or potatoes. Extremely versatile, freezes and dries well. Productive 24" plants are loaded with heavy sets of 10-12" long peppers. Sweet, 80-90 days from transplant. Guarantee: Garden America prides itself in offering only the highest quality seeds; those free of GMO’s noxious weeds and other invasive species, produced by growers that are supportive of sustainable agriculture practices. Liability limited to the purchase price. If you are not completely satisfied with the quality of these seeds, please contact Garden America directly at seeds@gardenamerica.com for an immediate replacement or refund.